In the first week of August Cult Events are curating a pop up gallery cafe next week in Camden. Following Mr. Penfold's private view on Thursday the 1st of August the gallery will be opened up to the public and host a pop up cafe serving fresh juices, coffee, sandwiches (with freshly baked bread and hackney cured ham etc.) until Sunday 4th, plus there are two special dinners on Friday 2nd and Saturday 3rd August. "An evening with Mr. Penfold is a dining experience in which the diner is fully immersed into the mind of the artist. A carefully curated space by Mr. Penfold himself draws the guest into his abstract world; full of colours and shapes that make the basis of his conceptual street art. Cult Events has designed a deconstructed menu of drinks and food to work in sync with the set design as well as the art; taking the diner on an aesthetic journey which will challenge three main senses; from taste to smell as well as vision. 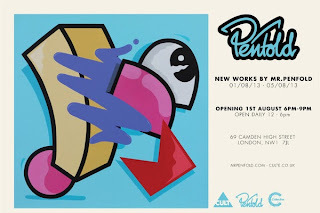 Private view: On August 1st, Cult Events present the highly anticipated inaugural London exhibition of Mr. Penfold with complimentary food, drinks (in usual 'Cult' fashion) & music (from Jonny Dett, Punchcutter & Will Ward for their guests. RSVP: penfoldguestlist@culte.co.uk"